Vienna is calling you for dancing with us at the VIENNA CALLING TANGO MARATHON 27-29 November 2015! Please find mor details on our VIENNA CALLING TANGO MARATOHN website or the Facebook Group! 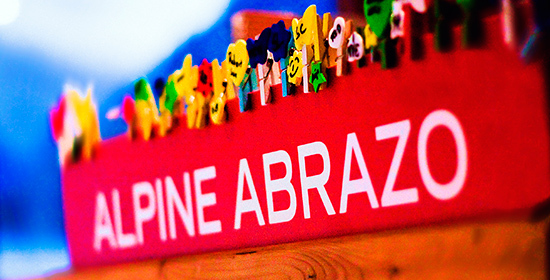 ALPINE ABRAZO 2015 - Last chance to see! 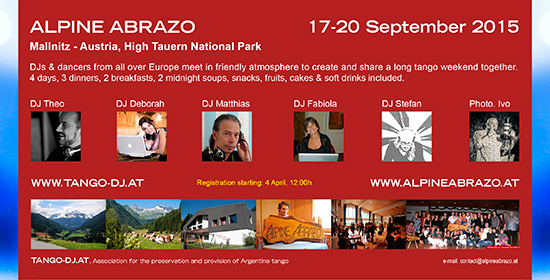 Our ALPINE ABRAZO will take place 17-20 September for the last time this year! So it is going to be the last chance to see it in case you have not been with us already! A lovely crowd of DJs and more than 100 dancers from all over Europe will meet in Mallnitz, High Tauern National Park in the center of Europe in order to share a wonderful tango weekend. We have some last minute places for leaders and couples available. Registration is possible until 7 September at the latest. Finally we have managed to set up our studio. And soon we will be able to concentrate again on actual tango music and transfering new old records and LPs! We are especially happy to have exclusive equipment as the Loricraft Record Cleaner PRC 4 provided by Loricraft Audio, a custom made stylus collection provided by Expert Stylus and the amazing TimeStep T-01EQ Archival and restoration EQ preamplifier provided by Sound Hi Fi. If you have LPs or 78 records and are interested in working with us, please get in touch! The new CTA releases will become available end of September or beginning of October. For TANGO-DJ.AT members for a pre-booking price of 90,- EUR for all three!